On Friday (7 Sept) lucerne on the Home Block at Ashley Dene was about 22 cm high which we estimate as being about 2200 kg DM/ha of standing dry matter (DM). This is based on calibrations we developed previously. At this time of year we expect every centimetre of lucerne height to translate to about 100 kg DM/ha (so 22 cm x 100 kg DM = 2200 kg DM/ha). We will be doing a destructive harvest over the next couple of weeks to confirm the relationship. Ewes with twin lambs at foot were put on yesterday (10 Sept) at a stocking rate of 14 ewes/ha. The lambs were aged between 2 days and 2 weeks old when they were put onto lucerne. 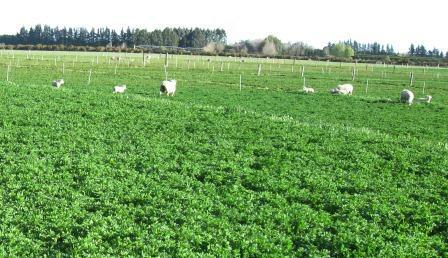 Lucerne had increased to about 24 cm high (or about 2400 kg DM/ha standing yield). Coopworth ewes with lambs grazing the spring set-stocked lucerne treatment at the Home Block at Ashley Dene. Salt blocks are provided in each paddock. Lucerne stores sodium in its roots and the feed the animals eat may not be able to meet animal health requirements. Lucerne was about 24 cm high when stock were put on the lucerne. This is equivalent to a pre-grazing mass of about 2400 kg DM/ha. All stock were weighed before they were assigned to their spring grazing treatment (rotational grazing, set-stocked or semi set-stocked management). Both the ewes and lambs will be weighed periodically during the spring season. This will allow us to find out what the impact of grazing management on liveweight production will be. 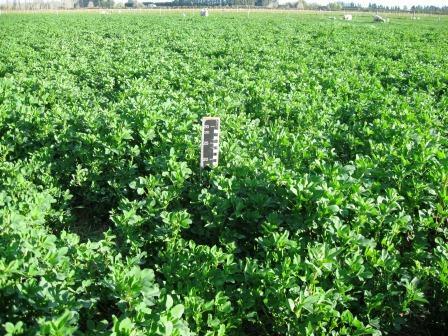 The plant measurements (DM yield and botanical composition) will allow us to quantify what the impact of the different grazing management will do to the lucerne stand in terms of productivity and subsequent persistence. Soil moisture measurements have also begun for the season and this will allow us to see when the lucerne extracts water from different soil layers and how much water it uses to produce the dry matter. As the soil dries, measurements will also allow us to determine at what point dry matter production is compromised.